If there is going to be a serious discussion about whether the AKP’s electoral supremacy has triggered authoritarian tendencies, the starting point has to be the recognition that such practices can co-exist with a representative, democratic system. In “Are reports of Turkey’s ‘authoritarianism’ overblown?”, Nagehan Alçı attempts to debunk an increasingly widespread criticism directed at the ruling Justice and Development Party (hereafter, AKP), namely that, after three landslide electoral victories the government is “moving toward an even tighter authoritarianism”. Alçı, a self-professed “liberal democrat”, strikes at “Western media” and the domestic proponents of the authoritarianism thesis for detracting from the AKP’s democratisation reforms, and challenges the government’s critics to put forward an alternative “vision for a democratic Turkey”. According to Alçı, this double offensive against the “the AKP powerhouse” is formulated internally by the advocates of “the Kemalist diktat” and externally by “some Western quarters”—the evidence of which is presented as the organisation of an academic conference on the Gezi Park protests at the University of Lisbon. There are several problems with Alçı’s spirited defence of the AKP’s democracy record, ranging from her uncritical discussion of the “democratisation package”, to her problematic use of a microscopic improvement in Turkey’s already nefarious record at the European Court of Human Rights. The latter is a version of what Lorenzo Fioramonti has called “the politics of numbers”, whereby the assumption that “numbers always reveal facts” becomes a trump card to dismiss broader engagements with multifaceted issues that cannot exclusively be understood in statistical terms. Yet the most troubling aspect of her argument is her casual dismissal of social forces and her inability to notice that the critics of the government do not have to be members or enthusiasts of the opposition parties, i.e. what she calls “the Kemalist diktat”. This defence is disturbing for democratic politics in Turkey, not because Alçı holds a significant place among the country’s progressive circles, but because her so-called “liberal democratic vintage [sic] point” corresponds to and reproduces a hegemonic logic of parliamentary politics which remains unresponsive to the concerns of non-parliamentary dissident voices and opposition groups. The Gezi Park protests, perhaps more than anything, have demonstrated broad discontent with the established parameters of political representation in Turkey. While political parties did feature in and join certain segments of the protests, the mobilisation was largely a non-partisan gathering of various actors that refused to be associated with a narrow party programme. Yet, even after the spectacular experience of Gezi, which, according to official numbers, brought together at least 2.5 million people across the country, the liberal-conservative axis that dominates the mainstream media in Turkey refuses to perceive grassroots movements and non-affiliated groups as legitimate political actors. If and when the claims of the non-parliamentary opposition are discussed, this is done in a way that associates them with the existing players in the political system, hence the proliferation of obscuring formulations, the most popular being the argument that the critics of the AKP can only be the stubborn vestiges of the Kemalist elite. It follows that Alçı’s emphasis on the “Kemalist diktat” should not be dismissed as a mere reflection of her political allegiance, but understood as a symptom of the fetish of parliamentary politics that continues to haunt the analytical lexicon of the commentators. It is the same failure to perceive politics beyond the parliamentary structure that has led Elif Şafak to lament that “Turkey's democracy is already a casualty” in the aftermath of the political chaos spawned by the corruption scandal. What is omitted in Şafak’s analysis is the fact that there are significant clusters within the opposition that are not associated with the mainstream parliamentary actors or the Gülen Movement—the “elephant” that confronts the AKP in Şafak’s elite-focused account. What of the AKP’s authoritarianism then? If we accept Alçı’s method and argument in her own terms, one can still find plenty of evidence to advance the claim that the AKP’s “democratisation” efforts have been superficial, if not entirely ineffective. But this would only mean scratching the surface of a broader phenomenon. 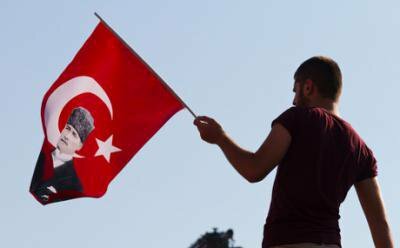 If there is going to be a serious discussion about whether the AKP’s electoral supremacy has triggered authoritarian tendencies, the starting point has to be the recognition that such practices can co-exist with a representative, democratic system. 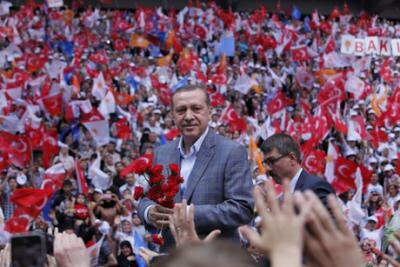 Indeed, many of the policies and practices that the critics condemn as “authoritarian” have been justified by the government on the basis of their electoral victories, as Prime Minister Erdoğan himself recites ad nauseam. It is the AKP’s understanding that a triumph in elections legitimises all government actions, since the right to form a government has been given to the party by the people. The combination of this parochial sense of democracy and a discourse of self-righteous rule has reinforced the AKP’s authoritarian streak. At the time of this article’s writing, access to Twitter has been blocked by the government—another example of its unwavering commitment to free speech and democracy. The limited appeal of the existing parliamentary opposition and the structural constraints of an exclusionary electoral system may yet prolong the AKP’s increasingly fragile grip on power in the local elections. But Erdoğan’s bravado and the deputies’ veneer of confidence will not be enough to mask the fact that the AKP government, in the eyes of a very significant portion of the country, has long since lost its legitimacy.